Danny Dyer ISN'T heading to Love Island? Update: Looks like Danny Dyer isn't heading into the Love Island villa, after all. Yep, what a let-down. Although Danny was seen flying off somewhere at an airport at the weekend, it appears that somewhere was the USA. In an Instagram shot shared by fansite loveislandreactions on Monday (July 23), a fan met Danny at Disney's Hollywood Studios in Orlando, Florida, saying he'd just seen the EastEnders actor on the Rock 'n' Roller Coaster. Our only hope is that Danny's making a quick connection in Orlando on the way to Majorca... We said it was a hope. Original: It's the moment you've all been waiting for. 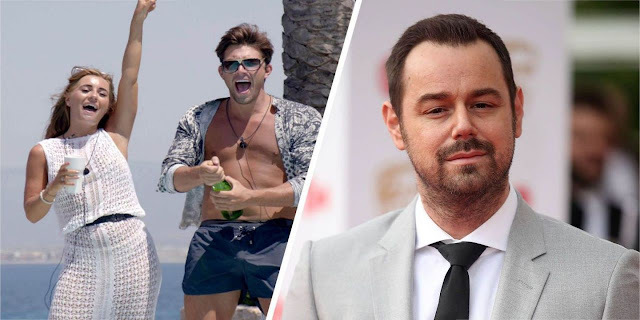 No, not chocolate biscuits in the discount aisle, but actual Danny Dyer is reportedly heading into the Love Island villa to see Dani Dyer and Jack Fincham. So you know how we've all been moaning about how ITV2 hasn't made the Islanders do any of the fun challenges this year yet? Well all that could be about to change, after the teaser for tonight's show puts the contestants through their paces with the lie detector test. But that's not all, because actual Danny Dyer has been photographed in a queue at the airport, with a fan sharing the photo along with the caption: "Danny Dyer was right behind us." And fans are as overexcited as we are, with one writing: "Danny Dyer being seen at an airport is the most exciting thing ever! I CANNOT WAIT," with another adding: "ALL IM SAYING IS DANNY DYER HAS BEEN SPOTTED AT THE AIRPORT, LOVE ISLAND HERE HE COMESSS!!!" This comes as Dani's mum Joanne previously revealed on This Morning on July 5 that Danny would love to go into the villa for Meet The Parents day, telling Holly Willoughby and Phillip Schofield: "Yeah, he'd want a cameo on that show. Yeah, he would love that."